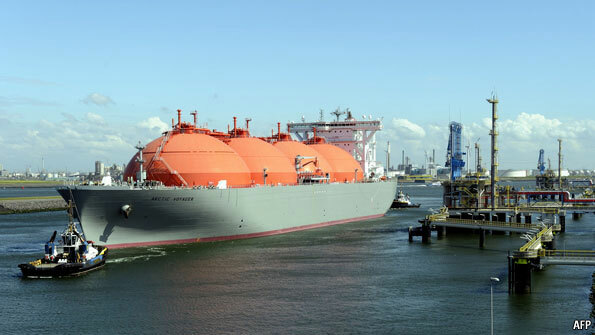 ALONG the coast of China, six vast liquefied natural gas (LNG) terminals are under construction; by the end of 2015 they should have more than doubled the amount of LNG that the country can import. At the other end of the country, gas is flowing in along a new pipeline from Turkmenistan. In between the two, geologists and engineers are looking at all sorts of new wells that might boost the country’s already fast-growing domestic production. China will consume 260 billion cubic metres (260bcm, which is 9.2 trillion cubic feet) of gas a year by 2015, according to the country’s 12th five-year plan, more than tripling 2008’s 81bcm. The roots of this rapid growth, though, do not lie in China’s centralised planning. They are to be found in a piece of deregulation enacted decades ago on the other side of the world: America’s Natural Gas Policy Act of 1978. America’s deregulation of its natural-gas market encouraged entrepreneurial energy companies to gamble on new technologies allowing them to extract the gas conventional drilling could not reach. Geologists had long known there was gas trapped in the country’s shale beds. Now the incentives for trying new ways of recovering it were greater, not least because, if it could be recovered, it could be got to market through pipelines newly obliged to offer “open access” to all comers. Decades of development later, the independent companies which embraced horizontal drilling and the use of high-pressure fluids to crack open the otherwise impermeable shales—a process known as “fracking”—have brought about a revolution. Shale now provides 23% of America’s natural gas, up from 4% in 2005. That upheaval in American gas markets has gone on to change the way gas is traded globally. A lot of LNG export capacity created with American markets in mind—global supply increased 58% over the past five years—is looking for new outlets. To the extent that the shale-gas success is repeated elsewhere, a vital source of energy will become available from an ever more diverse and numerous set of suppliers in increasingly free markets. This means that, unlike the boom in oil in the decades following the second world war, this growth in gas may not hand a powerful political weapon to those countries with the biggest reserves. Shale gas could significantly diminish the political clout that Russia, Venezuela and Iran once saw as part and parcel of their gas revenues. “The power of the shale-gas revolution has surprised everyone,” says Christof Rühl, chief economist at BP. In 2003 America’s National Petroleum Council estimated that North America (including Canada and Mexico) might have 1.1 trillion cubic metres (tcm) of recoverable shale gas. This year America’s Advanced Resources International reckoned there might be 50 times as much. 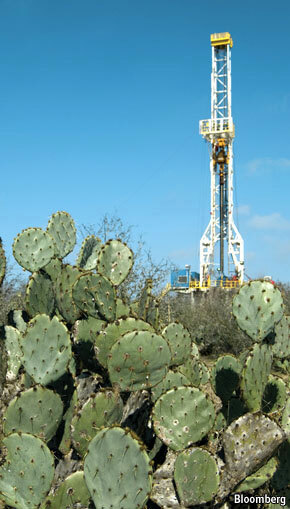 The shale-gas bounty is not confined to America. The country’s Energy Information Administration released a report in April that looked at 48 shale-gas basins in 32 countries (see map). It puts recoverable reserves at 190tcm, and that excludes possible finds in the former Soviet Union and the Middle East, where huge reserves of conventional gas will make investment in shale gas unlikely for years to come. In short order estimates of the Earth’s bounty of recoverable gas have expanded by about 40%. Improving extraction technologies and geological inquisitiveness are sure to raise that figure in the years to come. Nor is shale gas the only new sort of reserve: “tight gas” in sandstones and coal-bed methane (the sort of gas that used to kill canaries down mines) are also promising. Farther in the future, and more speculatively, there’s the gas frozen into hydrates on the planet’s continental shelves, which might offer more than 1,000tcm if a way can be found to exploit it. The cornucopian belief that human ingenuity will always find ways to increase the availability of resources is not a sure bet (see article). With gas, though, the odds look pretty good for decades to come. A scenario developed for the International Energy Agency’s forthcoming “World Energy Outlook” offers a sense of what may unfold. Called the “Golden age of gas”, it sees annual world production rising by 1.8tcm between now and 2035, when it reaches 5.1tcm. A fair bit of that is provided by unconventional sources (see chart). The growth is about 50% stronger than in the scenario used as a baseline; trade in gas between the world’s major regions doubles. Coal use declines from the late 2010s onwards, and by 2030 gas has surpassed it, providing a quarter of all the world’s energy. The development of shale-gas reserves beyond North America is still at an early stage. Although widespread pollution of groundwater by fracking seems unlikely (shales that hold gas typically lie far deeper than groundwater supplies), such risks have raised a great deal of environmental concern about the technology. Coupled with a sensitivity to the rural charms of la France profonde, this has led to a moratorium on shale-gas exploration in France. But in Poland, which may have Europe’s largest reserves, companies are busily sinking test wells to see what is there. In South Africa, which may have the largest shale-gas reserves on the continent, the shales in the Karoo basin have attracted the attention of Shell, which is increasingly billing itself as a gas-focused company. Shell is also one of the companies looking at shale-gas reserves in China, which may be the largest on the planet. Chinese interest in shale gas is strong, with state companies buying up American expertise as they take stakes in established shale-gas producers. The country might be producing its first shale gas at scale before the current five-year plan is over. Gas is currently bought and sold in three distinct global markets—North America, Europe and Asia—and prices differ widely between the three. In deregulated North America, with a competitive market and plenty of shale gas to augment conventional supplies, prices are low. In Asia, where gas is largely traded using a system of long-term contracts tied to the price of oil, prices are high. Europe sits in between: prices at the moment are around $4 per million btu in America, $8 in continental Europe and $11 in Asia (1m btu is about 300 kilowatt-hours). The origins of long-term contracts and oil-linked pricing go back a long way. When gas first began to be used a lot in the 1960s it was a substitute for home heating oil, and so it made sense to tie its price to that of oil. Because big exploration, extraction and infrastructure investments required pots of capital, long-term contracts became an industry norm. Today oil is generally no substitute for gas. Gas is used not to fill up cars and lorries—though there are gas-fired transport enthusiasts who would like to do something about that—but to fuel power stations and heat homes. Still, many gas producers are happy enough with the archaic pricing structure, particularly when oil prices are high. Customers with limited choices have had to put up with it. According to a recent study from the Massachusetts Institute of Technology, pipelines carry 80% of all gas traded between regions. The firms at the upstream end of those pipelines, such as Russia’s Gazprom, which supplies a quarter of all western Europe’s gas, thus have a strong hand in negotiations. Control of the pipelines meant that when Gazprom turned off the gas (as it did in 2009 in a dispute over trans-shipments through Ukraine), buyers had nowhere to turn for alternatives. Since then the European market has recovered. Prices rose after Libyan gas was cut off as a result of the country’s uprising and a lot of Qatari LNG has found a new destination in Japan, deprived of much of its nuclear power since the disaster at its Fukushima plant. Unsurprisingly, further attempts to pressure Gazprom into revising its terms have faltered. In February it rebuffed appeals by Germany’s e.ON, one of its most important customers, to link its gas to spot prices. Gazprom’s boss, Alexei Miller, told shareholders at the end of June that oil-indexed long-term gas contracts were here to stay. In private the company is still talking to customers about changing the shape of future contracts, and appears more inclined nowadays to regard European utilities as potential partners rather than spineless adversaries. Looking reasonable, say cynics, is a ruse to discourage investment in shale reserves and alternative pipelines. If an agreeable-seeming Gazprom, along with increased bullishness about LNG and shale gas, were to dampen European enthusiasm for Nabucco, a long-planned pipeline which might bring 30bcm of gas a year to Europe from the Caspian and the Middle East, that would suit Russia pretty well. But Russia’s new attitude could also spring from a realisation that the world really is changing. A study from the James Baker Institute at Rice University, published in July, reckons that, if shale-gas reserves are fully exploited, Gazprom’s share of the west European market might fall from 27% in 2009 to 13% by 2040. And Gazprom is finding that China, with which it has been negotiating pipeline deals since 2005, is not interested in the sort of long-term locked contracts that have previously typified Asian markets; indeed it is not even willing to pay European prices. Its immense shale-gas potential might make it even less willing to pay up, inclining it to depend less on pipeline gas and to take the risk that it can smooth out ebbs and flows through spot markets. If the proportion of imported pipeline gas falls, so does the pricing power of conventional suppliers, even if the overall volume they supply goes up. Increasingly, it looks as if today’s significant regional price differences will be arbitraged away, and that gas could become as fungible and as widely traded as oil. LNG’s growth (23% by volume in 2010) shows no sign of slowing. European LNG import capacity has more than doubled since 2000; the costs of building an import terminal have plunged. So far this year twice as many LNG vessels have been ordered from the world’s shipyards as in the whole of 2010. Qatar, which along with Iran and Russia holds the world’s most impressive conventional gas reserves, is adding new liquefaction plants. Other countries are also busily constructing export terminals; while Australia leads the way, Indonesia, Papua New Guinea and others are all set to bring more LNG to the world markets. There’s even work on liquefaction plants in America. One consequence of a global gas market supplied from widely distributed conventional and unconventional sources is that this diversity will reduce the power of big suppliers to set prices and bully buyers. There has been occasional talk of a “gas OPEC”, most audibly when, just before the end of 2008, a dozen or so gas producers met in Moscow under the chairmanship of Russia’s prime minister, Vladimir Putin. Despite the rattling of sabres on pipelines, though, something analogous to OPEC looks near impossible under current conditions. For one thing, utilities mostly have spare capacity and can thus adjust their fuel mix in a way that car drivers confronted with an oil shortage cannot. What is more, managing the supply of gas month by month, as the oil cartel seeks to do, would be near impossible when most gas continues to be supplied on long-term contracts that are difficult to break. And the new technologies are widening the production base all the time, weakening the strategic importance of conventional reserves and the power of those who hold them. Before shale gas, it was thought that Venezuela might soon become an important gas source for America, and that Iran’s vast gas reserves would motivate potential customers to break the sanctions imposed on it as a result of its nuclear programme. Both things are now less likely; the Baker Institute study suggests that while both countries will grow in importance—it foresees 26% of the world’s LNG coming from Venezuela, Iran and Nigeria by 2040—they will do so much more slowly than they would have in a world of constrained supplies. The growth of the gas market will not be untroubled. Large projects will be delayed sometimes, leading to periods of tight supply; there may also be overcapacity at times, as there has been recently. America’s shale-gas success—a matter not just of helpful geology and Yankee ingenuity, but also of various legal and regulatory positions such as those of the 1978 act—may prove hard to replicate in some other countries. Environmental worries could stop shale gas dead in places. But although the pace may slow and the road may have bumps, for the moment the revolution looks set to roll on.